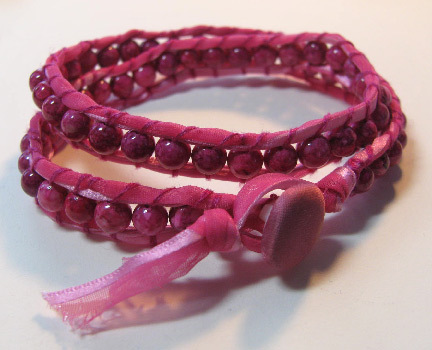 These beaded wrap bracelets are still wildly popular this spring, and they are so so so easy to make...you could whip up a few for yourself and for your Mom for Mother's Day! I used a couple different ribbons from Offray instead of cording, because the color selection is so fabulous. You'll have to experiment with length to see what works best for your size wrist. I like having enough left over cord to make tying the knots easier, so I use 26 inches for a single wrap, 46 inches for a double, and 62 inches for a triple wrap (the length will be halved, remember!). 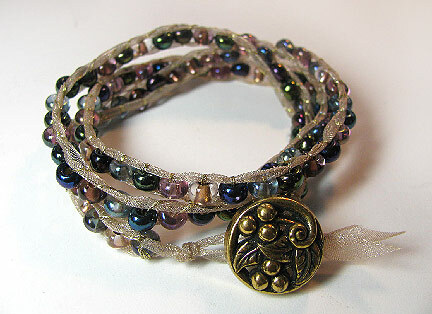 For this triple wrap bracelet, the portion that I stitched with beads was about 22 inches, plus the button and the clasp. 1. Cut the tip of one end of the ribbon on a sharp slant and wrap it with a small piece of tape. Thread this end through the button shank, and center it. 2. Tie a half hitch in the ribbon just below the button shank. 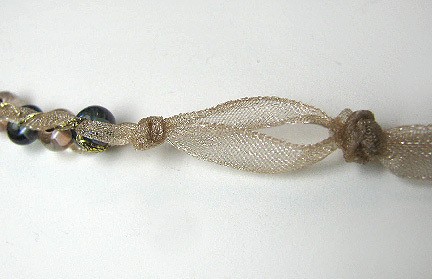 Knot your beading thread and anchor it in the ribbon knot using the needle. Take a few stitches back and forth to secure it. Leave the tail - you will glue and clip it later. 3. My instructions have you working from the bottom, from right to left. Start with the button on the right and the two halves of the ribbon extending towards the left, parallel to each other. 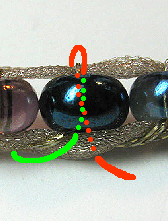 Pick up a bead with your threaded needle that you anchored in step 2. Follow the orange thread path in the photo, and bring the thread up behind the two ribbons, nestling the bead between them. 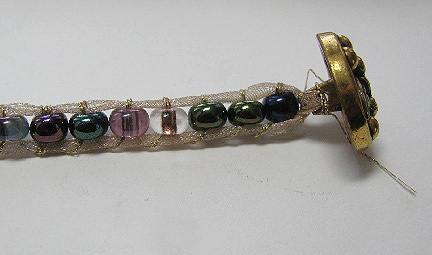 Take the thread up and over the top ribbon and insert it down into the bead from in front of the ribbons. Now follow the green thread path, exiting the needle in front of the bottom ribbon. Pick up a new bead and repeat. 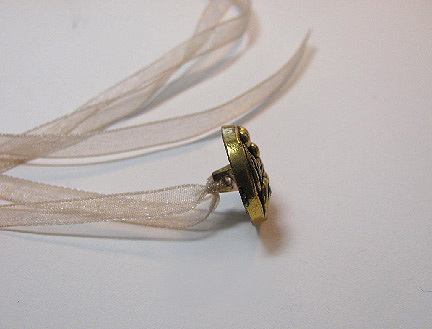 Pull the thread tight enough to roll the ribbon into a gently rounded cord, but not so tight that the beads buckle. Smooth each newly added bead to the left to make sure they sit side by side before picking up the next. 4. When you get to the end, tie an overhand knot in the ribbons right up against the last bead, and another knot far enough away to accommodate the button. Stitch back and forth through the first knot with your thread several times and stitch backwards through the ribbon and a few beads to anchor it. Knot the thread but leave the tail for now. 5. Use glue or Fray Check on all knots and on the ribbon just beyond the second knot. Trim the threads when dry and cut the ribbon ends at a slant. I still haven't made some of your other projects! You could keep me/us in our rooms for years with all the projects you share!! Love them!!! THanks...this might be fun to do with the grand daughter sometime this summer! Cyndi, I LOVE these! Are you selling them? Email me! I need to buy one! I love the shimmery ribbon you used, Cyndi. The bracelet is lovely.